Safflower Oil is good for the heart, blood vessels, hair, skin, muscles and immune system. It lowers cholesterol levels, prevents, stroke, atherosclerosis, clotting disorders and heart diseases. It helps to manage hyperglycemia, reduces weight and gives relief from symptoms of premenstrual syndrome. It also increases immunity, so it reduces the frequency of infections. In respiratory diseases, it loosens phlegm and acts as an expectorant, so it helps to clear the lungs and eases breathing. Safflower Oil is extracted from the Safflower seeds (seeds of Carthamus Tinctorius). The seeds are white and contain a high amount of proteins and good fat. The oil extracted from safflower seeds is colorless and flavorless. Its nutritional value is comparable to sunflower oil. There are two types of edible oil one contains monounsaturated fatty acid (oleic acid) and second contains polyunsaturated fatty acids (high linoleic). It contains less saturated fatty acids than olive oil. So, it is a better replacement for less healthy vegetable oils with affordable price. Safflower seed oil contains a significant amount of Vitamin E that is more than olive oil, but less than sunflower oil. It contains a good amount of Omega 6 fatty acid, so it is heart-healthy oil. Like olive oil, it is hot in potency, which means it increases heat in the body, so it is best suitable during winters and beneficial for people living in cold places. It improves metabolic rate, increases lean muscle mass, and supports fat loss. Safflower oil is prepared from untreated and treated seeds. Untreated seeds are bitter in taste. The oil extracted from untreated seeds is used in the production of linoleum floor tile, soap, paint solvent etc. This oil is not edible. Treated seeds are further two types and both are edible. One contains monounsaturated fatty acids and second contains polyunsaturated fatty acids. Safflower Oil is a heart-healthy oil and available in two varieties – high-oleic safflower oil and high-linoleic safflower oil. Both are good for the heart and lowering cholesterol level. The omega-6 in them helps to improve cognition. High linoleic safflower oil is beneficial in skin conditions and useful in acne and blemishes. Inflammation occurs in blood vessels in response to oxidized LDL cholesterol, infections, and several other factors. Oil is a rich source of PUFA, which ultimately helps to prevent atherosclerosis by two mechanisms – lowering LDL cholesterol and reducing inflammation. With similar mechanisms discussed under hypercholesterolemia and atherosclerosis, it also prevents strokes and heart attacks. In addition, it also possesses anti-ischemic and anti-thrombotic properties, which also helps to prevent ischemia and formation of thrombus in the blood vessels. The claims made for Safflower oil that it lowers fasting blood sugar level or increases insulin sensitivity are not appropriate, not much significant, and not yet acceptable due to lack of strong evidence. However, the participants were postmenopausal women suffering from diabetes type-2. The effects of safflower oil in men and young women were not observed in this study. If we take omega-6 in consideration, then omega-6 fatty acids are not likely to promote weight loss. Therefore, Flaxseeds and Flaxseed Oil are still better options for losing weight. In conclusion, the current evidences don’t suggest safflower oil as a fat burner. However, it can help to shift the abdominal fat away instead of burning overall fat in the body. However, the over-consumption of omega-6 fatty acids in relation to omega-3 fatty acids can increase risk of inflammation in the body. Safflower oil contains omega-6 fatty acids, so the best results can be achievable if it is mixed with oil rich in omega-3 fatty acids. In case of cooking, mixing it with olive oil is likely to be best. Alternatively, one can also consume walnut, chia seeds, and flaxseeds for omega-3 fatty acids. The high linoleic Safflower oil can help to treat acne. 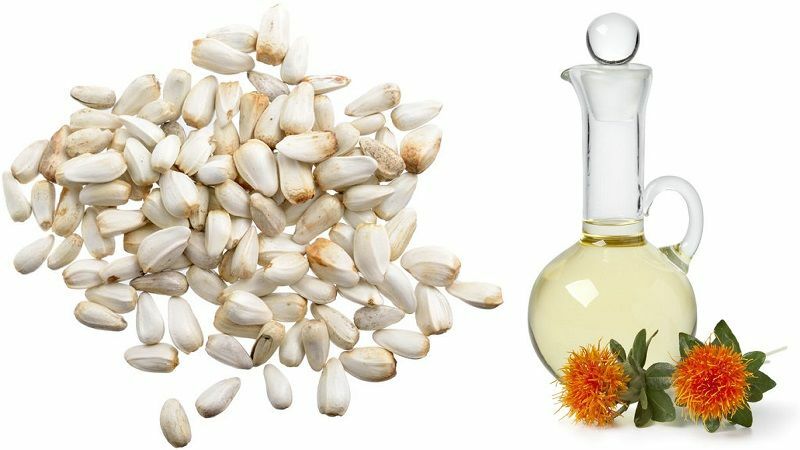 Safflower oil is a rich source of linoleic acid that helps to reduce sebum accumulation under the skin and thus, reduces acne, pimples, whiteheads, and blackheads. In addition, it also acts as wound healing enhancer and prevents infections. It also promotes regeneration of the skin cells, which helps to make skin clearer and prevents the formation of acne scars. The local application of cold-pressed high-linoleic safflower oil helps to reduce intense itching sensation that occurs due to various underlying causes including skin infections, dry skin, rashes, etc. It should be applied to the affected skin 5 to 6 times a day to get relief from itchy skin. Its application should be continued for 3 to 5 days. The cold-pressed high-linoleic safflower oil promotes wound healing. It is highly useful in cases of old non-healing wounds. Its regular application enhances the wound healing rate and protects the wound from infections. According to ayurveda, safflower seed oil helps to treat constipation. The possible mechanism includes its lubricating effect on the large intestine and mild laxative action. The cold-pressed high-linoleic safflower oil is helpful for regulating prostaglandins in the body due to its high linoleic acid. Therefore, it reduces sudden hormonal fluctuations. Ultimately, it reduces the symptoms of premenstrual syndrome. How much Safflower Oil should I take a day? The World Health Organization recommends 5-8% energy from omega-6 fatty acid. According to this, an adult can take 6 to 10 grams high-linoleic safflower seed oil daily. Safflower seed oil is likely safe for everyone as a part of food or dietary supplement when taken in an appropriate amount. It has blood thinning effects, so it can slow blood clotting. Safflower oil is possibly safe for pregnant women when taken as a food in an appropriate amount that can be easily digested. The safety profile of Safflower oil for lactating mothers is unknown. ‘Kusum’ is also Hindi name of Ceylon Oak – Syn. Lac Tree (Schleichera Oleosa – Syn. Schleichera Trijuga Willd). So, there are two types of Kusum oil available in Indian Market – Safflower oil and Kusum oil extracted from seeds of Schleichera The last is not edible and only used as an external application for treating skin diseases. Kusumba oil or Kusuma oil is also a type of Safflower oil. It is unprocessed, unrefined, cold-pressed, high linoleic acid higher breed safflower seed oil. It is commonly used along with Thanaka Powder for removing facial hair and acne. Safflower oil is not effective for reducing weight. I have been using it since last six months for cooking food. You have given right information and your conclusion is likewise great according to my experience. You can use flaxseed oil. It helped me to lose 2 Kg weight in a month.